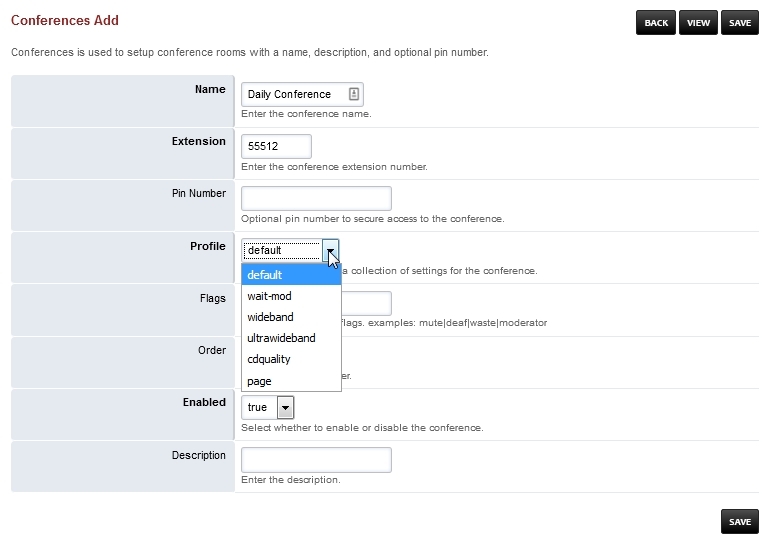 Conferences is used to setup conference rooms with a name, description, and optional pin number. Name: Name for the conference. Pin Number: If you want to add a layer of security to enter the conference. Default- The default audio quality rate and video. wideband- Wideband audio quality rate and video. ultra-wideband- Ultra wideband quality rate and video. cdquality- CD Quality rate and video. Order: The order of the conference. Enabled: If the conference is enabled. Description: A way to organize what the conference purpose is. By default Conferences use to be hidden from the menu.